This brown soda bread is full of fiber, yeast-free and so simple to prepare. 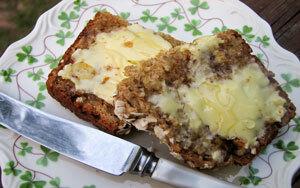 If you can find Irish imported brown whole wheat flour, you’ll get the best results. Preheat oven to 425 degrees. Grease and flour three 8-by-4-by-2-inch loaf pans. Measure all dry ingredients in large bowl. Rub in butter with your fingertips and create a well in center of mix. Beat egg in small bowl and mix with buttermilk and honey. Add to dry ingredients and mix well with large spoon. Transfer dough to floured surface and knead gently with floured hands. Divide dough into loaves and place each loaf into a pan. Using knife, cut line down center of each loaf. Bake for 40 minutes to deep golden brown color, or until base of loaf sounds hollow when lightly tapped. Makes 3 loaves. Published on February 23, 2017 in Side Dishes.